Save $1.00 on any Glad Food Protection Item (excluding 22 ct. and 29 ct. Food Bags). Register at glad.com and be the first to know when coupons are available and new product news. 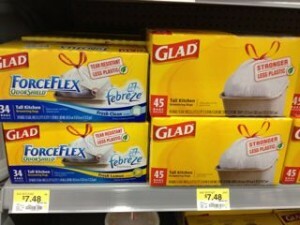 See glad's latest special offers and promotion, sometimes they may have coupons. If you have the target cartwheel App, there's a 5% coupon for glad trash bags, excludes sizes smaller than 56 count.